NEW YORK, Oct. 10, 2017 /PRNewswire/ -- Concierge Auctions has announced it is accepting premier properties for the firm's second auction this year specifically targeting Chinese buyers and investors. Following a high-impact marketing and event campaign alongside three media powerhouses, The Wall Street Journal, Mansion Global, and The Real Deal, the December 13-14th auction is designed to directly reach the world's second largest economy and will feature a carefully curated selection of the world's finest properties. "Our inaugural Summer Sale resulted in more than 50 bidders and $60 million in transactions. We sold 14 properties in just 36 hours, added 6,400 new clients to our database, doubled website traffic, and experienced 1,000 new downloads of the Concierge Auctions app," stated Concierge Auctions Chairman Chad Roffers. "Coming off the heels of this success, we are ready to kick off round two and further expand our reach to high-net-worth Chinese buyers. Our extensive database consisting of more than 80,000 buyer prospects, clients, and agents, paired with our targeted outreach to affluent Chinese individuals, is sure to make for another successful sale, greatly benefiting sellers and buyers alike." Concierge Auctions is kick-starting the sale as a gold sponsor of The Real Deal's Third Annual Real Estate Showcase/Forum in Shanghai, to be held November 2nd – 4th, gaining direct access to more than 3,500 attendees including the most desirable and hard-to-reach Chinese buyers and investors. 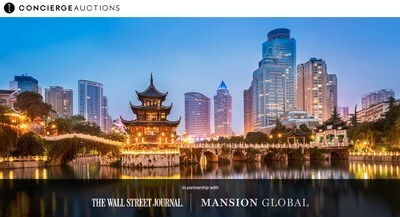 Additionally, Concierge Auctions will once again partner with media powerhouses The Wall Street Journal and Mansion Global to market the sale, adding valuable exposure including outreach to Hurun's database of more than 110,000 high-net-worth Chinese clients and a co-hosted closing event to be held in Hong Kong. Bidding will be hosted on the Concierge Auctions global marketplace, ConciergeAuctions.com. "Following the enormous success of Concierge Auctions' Summer Sale, The Wall Street Journal and Mansion Global are thrilled to partner with the auction firm for a second time," stated Luke Bahrenburg, Vice President, Real Estate at Dow Jones. "As interest in luxury homes around the world continues to grow, we expect the upcoming sale to provide unparalleled opportunities for our Chinese audience of high-net-worth buyers." Ideal properties for the sale are located in well-known destinations offering top-notch schools and easy access to China via direct flights; are solid investments for future generations; and are valued at a price that is in comparison to Chinese real estate. Additionally, the properties that offer financial security and a possibility for rental income; and feature characteristics that adhere to Feng Shui and numerology guidelines are also a plus. As part of Concierge Auction's Key for KeyTM giving program in partnership with Giveback Homes, each closing from the December Sale will result in a new home built for a family in need. To find out more about how your property could be considered for the December Sale, call +1.212.202.2940 or visit ChinaPortfolioSale.com to download a brochure with the exposure and outreach plan for the sale, and a white paper on Chinese real estate investment. All properties available for purchase in the sale will be on the website, ConciergeAuctions.com, in November. Space is limited. Concierge Auctions also offers commissions to listing and buying real estate agents. See Auction Terms and Conditions for full details.